I really appreciate Rory’s experience and dedication to ministry. He does articulate some very insightful things relating to working and serving as an artist within the church. His perspectives are rich because he has worked with many different artists, and done more than just music in the church. There were a couple chapters that I connected with personally, and found some things I could take away with me. His thoughts and observations about negativity in the church were right on. Then his challenges to be a good leader and love the church where God has put you are great. 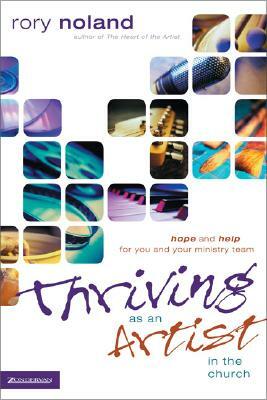 I think this book would be good read for younger/greener worship leaders. For me, most of this book was a discussion of many things I’ve lived and encountered through my years in ministry. I can see how most of the chapters could work well as a discussion with individuals and small groups of artists. An excellent resource for both individuals and arts ministry teams, the book includes slice-of-church-life scenarios, group discussion questions, and personal action steps. It’s not easy being an Artist in the church. But whatever your passion—music, visual art, drama, dance, writing, technical arts—you can not only survive, but thrive. And the rewards far outweigh the pressures of weekly services, artistic differences, and relational conflicts. After all, where else could you consistently make a contribution of eternal significance, experience deep community with other artists, and grow closer to God as a result? Written by an artist for artists, this book will help make your ministry experience sustainable and life-giving so you can fall in love with the church all over again.A composer, songwriter, author, and speaker, Rory is a graduate of the Chicago Musical College at Roosevelt University and served for twenty years as music director at Willow Creek Community Church.